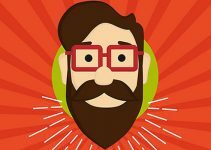 Minoxidil For Beards - Can Minoxidil Grow Facial Hair? When the drug Minoxidil was first being developed in the 1950s, it was, surprisingly, engineered to treat ulcers and most people did not consider Minoxidil for beards. Unfortunately for hopeful chronic ulcer patients, Minoxidil did not have any effect on ulcers. However, many great discoveries have been made by accident, and it turned out that Minoxidil was a very effective vasodilator. That is, it had the ability to widen blood vessels. This came as unexpected and hopeful news to people suffering from narrowed blood vessels, particularly those with certain heart conditions related to narrowing vessels and lack of sufficient blood supply to the heart. The drug’s developer, the Upjohn Company (which later joined up with Pfizer), immediately changed its focus with Minoxidil from ulcers to testing the drug for its vasodilator qualities and effectiveness on heart and other related diseases. As new testing progressed, the company began to see success with Minoxidil as a vasodilator. They also began to notice another curious side effect: some users who had experienced hair loss and baldness were re-growing hair. It was another accidental discovery and another “lightbulb” moment for Pfizer, which subsequently began testing it as a hair growth treatment. By the 1980s, Minoxidil, marketed under the brand name Rogaine, was becoming a household name, not for its ability to treat heart disease, but as a cure for baldness. What Causes Hair Loss in the First Place? Alopecia areata: With this condition, hair falls out in patches over a very short period of time. It is caused by an autoimmune system disorder. A person with alopecia may or may not eventually regrow their hair. There is no cure for alopecia areata. Alopecia totalis: With this condition, all of the head hair is lost. It can develop following alopecia areata (but won’t necessarily always). It can also develop without beginning as alopecia areata. Like areata, it may reverse itself with time, or the sufferer may never regrow their hair. There is no cure. Alopecia universalis: With this condition, all body hair falls out, not just head hair. This includes facial hair (even eyebrows). There is no cure, and most people with the condition never regrow hair. 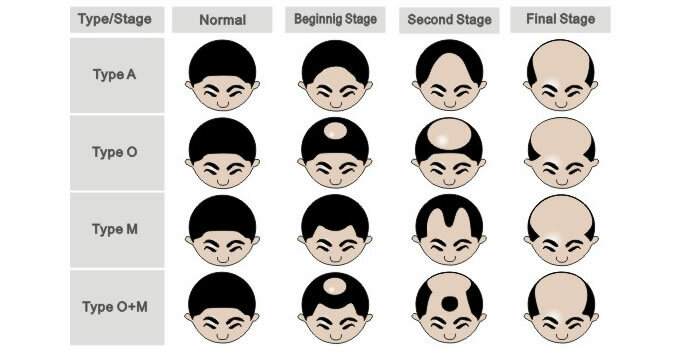 Androgenetic alopecia: This is also known as male pattern baldness in men and female pattern baldness in women. It is the most common type of hair loss, and it is more common in men than in women. 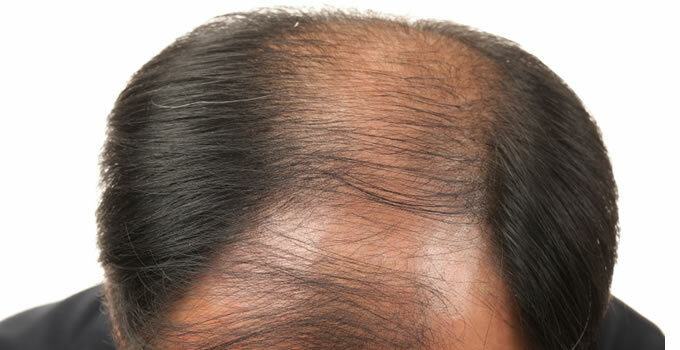 Hair begins to thin and disappear in typical patterns (crown, forehead). The difference between this type of alopecia and the previous ones is that hair loss is not due to hair falling out. Instead, individual hairs simply stop growing. Some professionals classify male pattern baldness and female pattern baldness differently. Male pattern baldness is known to be caused by a combination of genetics and hormones, while the cause in women isn’t as clear. For that reason, some professionals are reluctant to categorize female pattern baldness as androgenetic alopecia. Minoxidil has not been shown to be effective on all types of hair loss. The reason for this has to do with the root cause of this type of baldness, which is different from the other types of baldness previously mentioned. To understand how it is different, you must first have an understanding of how hair grows and what causes it to stop. Talk about getting to the root of the problem… the root of the individual hair is indeed where the problem begins. That’s because this is where the hair is “born.” Every single hair comes from a microscopic root, known as a follicle. Each follicle is pre-programmed by a person’s particular genetic makeup. Genes determine how many follicles a person has (humans are born with all of the follicles they will ever have and will never grow new ones), where they are placed and at what stage of life they will begin to grow. For some, genes also determine when those follicles will die. Others may live their whole lives and not experience significant or noticeable follicle death. It was once thought that when a follicle shut down production, that was it and that follicle would never grow hair again. Still others speculated that there might be ways to re-awaken those dormant follicles, though no theoretical treatment was ever really successful until Pfizer accidentally discovered Minoxidil’s surprise power. Once that genetically pre-determined period is up, the hair enters the second, or catagen phase. The follicle receives a chemical signal from the brain which tells it to stop producing new hair cells. What hair is left inside of the root pushes its way out through the skin’s surface and falls out (which is one of the main reasons you find hair in your shower drain), and the follicle enters the telogen phase. During this phase, the follicle is dormant and at rest. It needs this period, typically one to four months, to replenish itself, take in new nutrients and get itself ready to start the cycle all over again. Assuming you don’t have mitigating factors such as poor nutrition or skin trauma, this process will repeat itself over and over again until your genetics tell it to stop. For men, DHT may be one of those mitigating factors that sends follicles into early dormancy. 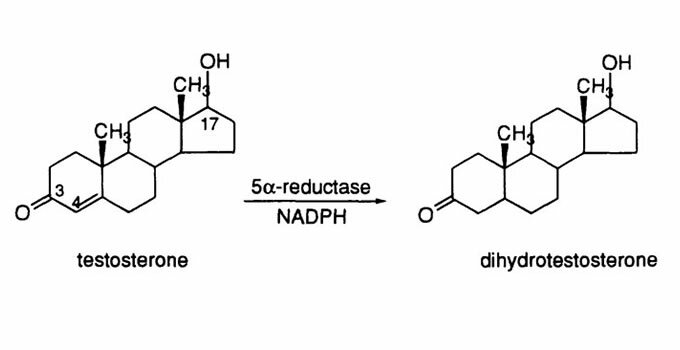 DHT is short for dihydrotestosterone. You might recognize the root word “testosterone.” DHT forms when testosterone comes into contact with an enzyme known as 5-alpha-reductase. This process is actually very important in the developing of the male baby. It is what forms the external characteristics associated with the male body. Unfortunately, the body maintains the ability to create DHT, which is not quite as good for the male body in adult life. Among other things, DHT is a significant factor in male pattern baldness. 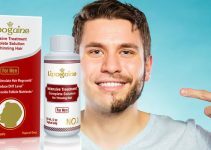 There is a lot of conflicting information on the Web regarding the effectiveness of Minoxidil for beards, making things very confusing for potential users. The truth is, Minoxidil will only be effective on certain types of hair loss, primarily that which is not caused by DHT. Minoxidil merely expands blood vessels so that more nutrients and oxygen can reach hair follicles, but it does not block the formation of DHT. In such a case, it might still be possible for a person to regrow hair, but he would need to use a product that contained a DHT-blocker instead of Minoxidil. DHT has the same effect on beard hair that it has on head hair. DHT binds to the follicle, which is what shuts the follicle down. It doesn’t matter if it’s a mustache/beard hair follicle or a scalp hair follicle. DHT is an equal-opportunity destroyer. How Do I Know What Kind Of Hair Loss I Have? Determining the type of hair loss that you have can be tricky. Sudden hair loss where hair falls out in large clumps is most likely due to alopecia areata, totalis or universalis, and a doctor can confirm this for you. However, if your hair loss is gradual, it’s likely due to either constricted blood vessels or overproduction of DHT in your body, or even a combination of both. A blood test can detect the presence of excessive DHT in your blood. Even so, some men find that even when they seem to have found a reason for their hair loss, they still can’t successfully regrow their hair with a hair growth formula. How Long Does It Take for Minoxidil to Work? Don’t start taking Minoxidil unless you’re prepared to give it adequate time to work. Some men see results in as soon as three months, but most take several months to a year to see any significant hair growth. 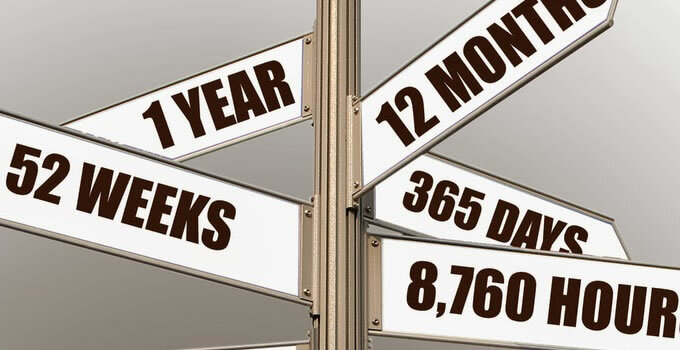 Don’t pass judgment until you have been using the product consistently for at least one year. If after one year of using the product as directed you see only minute or no significant growth, it’s probably safe to say that Minoxidil won’t work for you. Your inability to grow hair in this case is probably related to some other underlying cause and not the presence of excessive DHT. This doesn’t mean there is no hope for you. All it means is that if you want to grow a beard you’ll have to try a different, non-Minoxidil-containing product. It might also be that the reason your beard is sparse or bald in some places is simply that there are no hair follicles there at all. If this is the case, no hair or beard growth vitamin will cause you to grow hair in those places. How Does Minoxidil Affect Hair Growth? It is important to understand that if you want to grow hair with Minoxidil whether hair on the head or us the Minoxidil for beards, it requires a significant and ongoing commitment. Assuming that you are successfully able to regrow your hair, it will only keep growing with consistent Minoxidil use. If you stop using it, those blood vessels will constrict, the follicles will shrink and you’ll lose your hair again. Shop around before buying. Remember, “Minoxidil” is not a brand name (although some stores sell a generic version of it under that name, like Costco). It is the name of the chemical formula. Minoxidil can be found in a number of different hair growth products. Rogaine is the most popular. Keeping this in mind, do some comparison shopping before buying. The drug is the same regardless of the brand name so you might as well not pay more than you have to. Best place to buy is on Amazon.com. Don’t bulk-buy until you know it is going to work for you. Again, this product isn’t cheap, so buy one bottle and see if it yields results. If you do see growth, you can bulk-buy the next round. Don’t use more than you need when using Minoxidil for beards. More is not necessarily better. Stick to the amount of product the instructions say to use and no more. Don’t apply it more frequently than recommended, either. Use the lowest concentration that gets the job done. Typically, that is about two to five percent. When using Minoxidil for beards, avoid contact with other parts of your body. Don’t let the product get on any skin outside of the hairline. Apply the product with latex gloves, or wash your hands very thoroughly with soap and warm water after applying. Take advantage of customer service with whichever brand you use. If you run into problems or have questions about the particular brand you are using, contact the customer service desk of that brand. They will be able to counsel you about how best to use the product, what concentration you should use and any other issues you run into. Don’t expect miracles when using Minoxidil for beards. No hair growth product, beard growth cream, Minoxidil or otherwise, will grow hair where hair has never before existed. In other words, if you do get the product on your hands, you will not grow hair on your hands. This also means that if your beard has always had patchy spots, Minoxidil may not magically fill in those spots if the reason they exist is simply that there are few or no hair follicles concentrated in those areas. Minoxidil has been linked to birth defects in the babies of pregnant women. 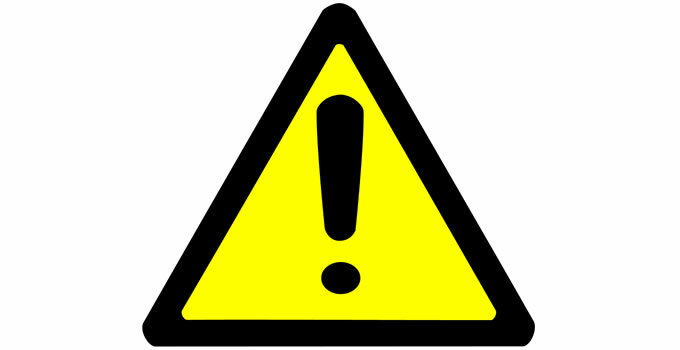 Since there is no safe exposure level to Minoxidil for pregnant women (or women who may become pregnant), Minoxidil is not recommended for use in such households. It should also be avoided if a mother is breastfeeding, since traces of the drug may be passed on through breast milk. It is also recommended that Minoxidil be kept away from children. It should either be kept out of the house, or it should be stored where children cannot access it. It is also critical that the user ensure that he does not transfer Minoxidil residue to a child via skin-to-skin contact. Does Minoxidil Work On Women? Women can suffer androgenetic alopecia just like men, although it is much less common in females. Fortunately, women may be able to regrow their hair with Minoxidil just as some men can. Minoxidil formulas come in two concentrations: two percent and five percent. Originally, the five percent solution was recommended only for men, although women could use the 2 percent solution. However, the five percent solution was approved by the FDA for use on women in 2014. Whether or not it will be effective depends, again, on the type of hair loss the woman is experiencing. Many women suffering from androgenetic alopecia have experienced moderate to good success using Minoxidil. However, as previously mentioned, Minoxidil can cause birth defects in a developing baby. Women who are pregnant or planning to become pregnant should not use Minoxidil at all. Breastfeeding mothers should also avoid it. So having looked at the history of Minoxidil, it’s use, and what types of hair loss it can actually help, the big question: Is Minoxidil For Beards? 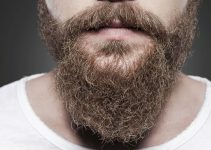 Since mustache and beard hair are structurally the same, Minoxidil should have the same effect on beard hair as it does the hair on your scalp. That being said, you won’t really know for sure until you try it. If it’s only beard hair that you want to target and not head hair, that’s okay. Because Minoxidil is a topical solution (either a foam or a liquid), you can apply it directly and only to the areas where you want to grow hair. 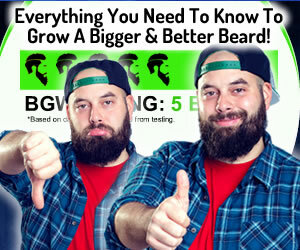 If it’s just your beard/mustache you are targeting, simply apply the product exclusively to those areas. Many men do report that after using Minoxidil for beards, it helped them to grow a thicker and fuller beard. 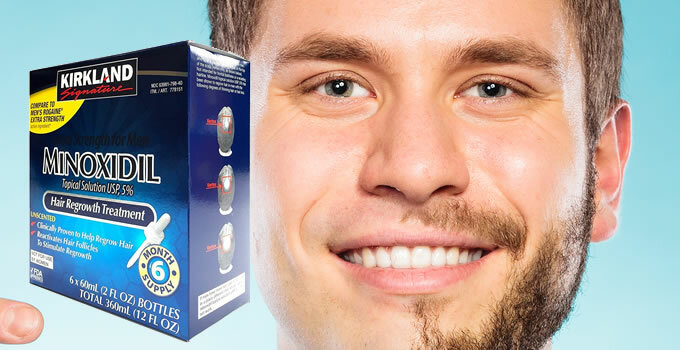 So it appears, that if a man has a patchy or thin beard that Minoxidil can help that facial hair to grow better. However, if this is being used and applied to an area on the face that has never had facial hair before, then Minoxidil may not do much to grow hair if there has never been hair there before. So is Minoxidil for beards? The answer is YES, Minoxidil can be used to help grow a beard faster and other facial hair issues but it all depends on the top of hair loss or hair growth issues you have.